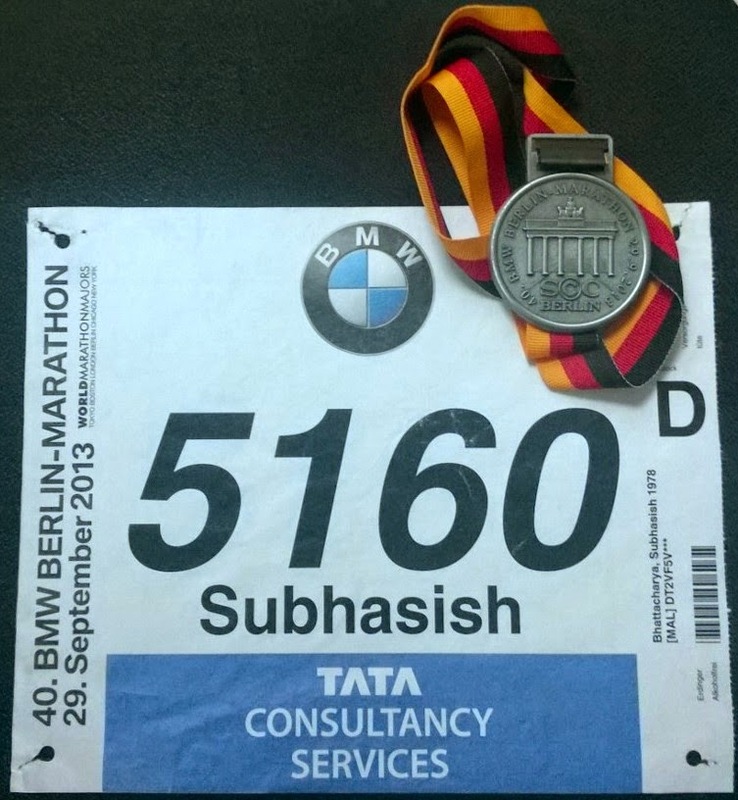 I had first signed up to run the Berlin marathon in 2011. 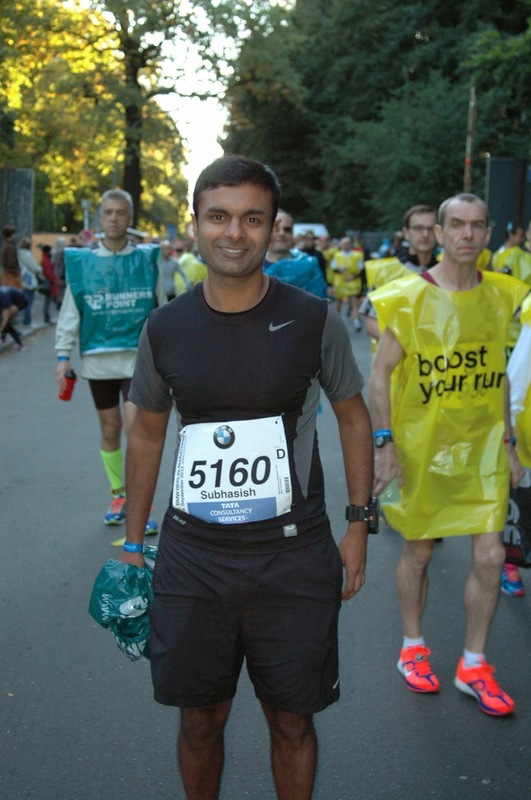 It was to follow a PR and my best marathon to date in Paris in the Spring of 2011. I had hoped to build on my level of fitness to a finish of around about 3:05. All did not go well. My dad was in his last stages. I got hit by a car. The upshot of adjusting for that injury resulted in a stress fracture less than two weeks before the race. I continued to be in denial and even walked to the race start deluding myself that I could run. A test run at the start made me realize my fallacy. I removed my bib and proceeded to watch the race as a spectator. It did have a world record set so it was not a bad watch. After the race I continued home. My dad passed on the day after I reached. I knew I had to run the Berlin marathon again. 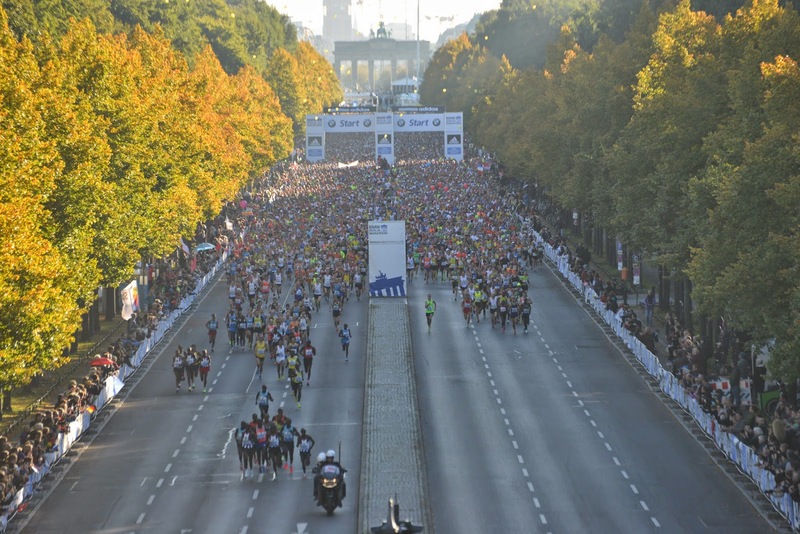 I signed up for the Berlin marathon 2013. The hope was that I would be able to get in the race I wanted to in 2011. I quite never had managed to recover to the level of fitness I had in 2011. I did race in 2012 and got a relatively decent time in Chicago (3:22) but that was with minimal training. 2013 proceeded in a similar manner. I ran the Disney Goofy challenge 2013 (half + full in back to back days). I was getting a semblance of a marathon training cycle for the Flying Pig marathon before getting injured 4 weeks before the race. I ran the Mayor's marathon in Alaska in June and Missola marathon in July... I wanted to have my cake and eat it too. I wanted to go down the path of getting to finishing a marathon in 50 states yet being able to run a fast marathon as well. I rationalized this as running some marathons as "training runs". The hope was that the Missola marathon I would fit into a Pfitzinger 12 week training plan for Berlin. As a part of that training I would get back into shape. The fallacy didn't last long and I was soon off track during training. I ended up with about a hundred miles each in June, July and August. I ran very little in the last six weeks before the marathon. Things came to a head when I tried to finish a the Skagit marathon in the first week of September but sensibly quit after a horrible 14 miles. I only ran 6 miles between that run and the marathon. 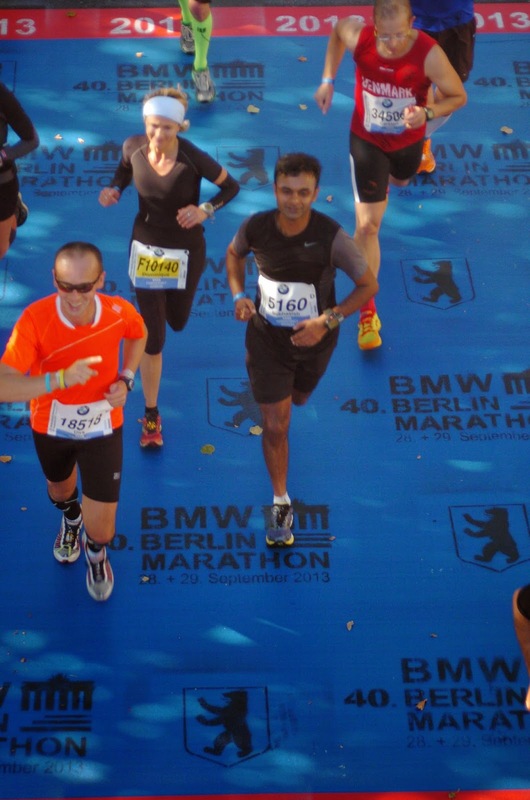 I proceeded to Berlin with a will to finish at any cost and not repeat the DNF of 2011. I reached Berlin with very little pressure or anticipation of the race. I knew things would get ugly. I however had decided that this would be the last crappy marathon I would run. I would run Berlin again. I would run it well. With that resolution out of the way I could proceed with the matter at hand. The race day morning. September 29th 2013. The second anniversary of my dad's passing. He would be in my thoughts. The conditions were perfect for running - 45F and sunny. This is one of the factors that makes the Berlin marathon such a fast race - the predictably hospitable running weather. As I made my way to the start the shining Brandenburg gate gate was visible in the distance. I was assigned to corral D (3-3:15) based on my time from Paris. This would be another embarrassment much like my Chicago marathon corral seeding. Haile Gebrselassie spoke before the race got started. He mentioned how he wished he could be running in such perfect conditions. With that the run started. I felt awesome. Too awesome for someone so woefully under-trained. I was running around 7:15 pace to start off. I knew this would not last but I wanted to enjoy the feeling anyhow. The kilometer markers were spot on. I was also impressed with how much space I had to run. This is in contrast to the narrow roads in a race like Paris. Water stations were every 5km. It was interesting that some of them had hot tea too?? It was here that I passed the area I had been spectating in, in 2011. With the Reichstag and Berliner Dom visible in the distance. I was still going "strong"
It was just as well since the Powerade sports drink was not cutting it for me. I did have salt tabs but should have had another electrolyte source. "The wheels begin to fall off"
It is perhaps psychological to some extent but after the half the struggle began to start. On good days the half is when you are rejuvenated. I muttered to myself about how Chicago was a faster course and had better crowd support. I seemed to find hills and wondered how everyone called this flat. All untrue. I also began to walk. This was far too early in the race and was an ominous sign. The marathon is a mental quest and once you give in it's tough to get back on track. The Ethiopian dinner from the previous night was working "wonders" with my stomach. I decided I might as well stop at a porta potty. I had to wait in a line and that cost me more wasted time. At the very least it made running there after a bit more comfortable. The course made it's way through the eastern part of Berlin. Quite an atmosphere with traditional musicians. "The death march to the finish"
I proceeded with my gentle amble to the finish posing for the pictures from Marathonfoto. Hey, I did pay for the package!! During one walk break I was quite jolted when a young lady called me out by my full name and egged me to run. I immediately commenced running until she was out of sight lest she scolds me again. 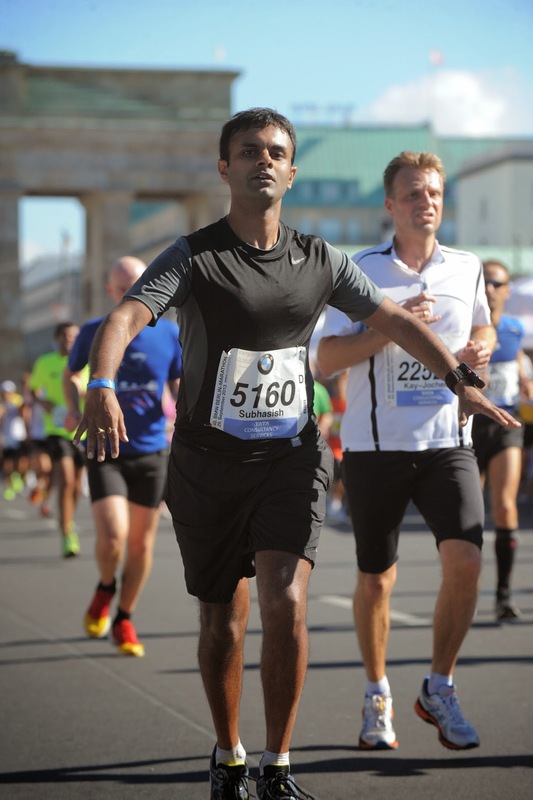 Perhaps one of the most famous of marathon finishes - the Brandenburg gate... I had read about how in 1990, just 3 days after the reunion, at the marathon how people wept as the passing through it. Today was not my day. Yet finishing 26.2 miles or 42.2 km is still a worthy effort. Marathon #29 was in the books. I achieved my primary goal for this marathon - I finished. It wasn't pretty. You really can't cheat the marathon. If you are not trained it will get to you. 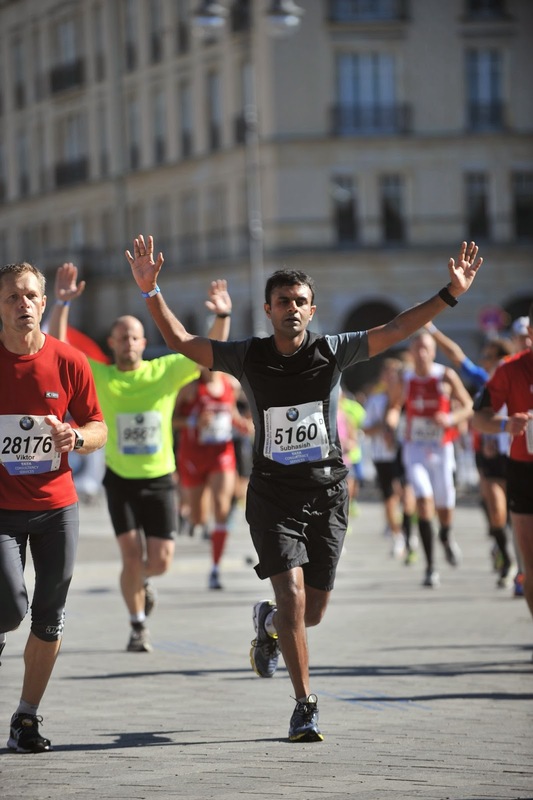 To run a good marathon you need to be well trained. Period. Berlin is one of my favorite cities in the world. I love everything about it. I dig the ambiance. This can't be my last marathon memory there can it? I was signed up for the Las Vegas and Memphis St Jude's marathons next. I've cancelled my registrations. I don't know when my next marathon will be. Whenever it is, it's going to be a marathon I will be well trained for. The 50 stater thing is off. I have a limited amount of time to run quality marathons. I've got to make the best of that time!! You have to keep moving forward!